Ecoregions are geographical regions that are characterized by specific ecological patterns, including soil health, flora and fauna, climatic conditions, among other factors. Conservation organizations and environmental agencies use the concept of an ecoregion to systematically understand how biodiversity levels and ecosystem dynamics differ across the world. The WWF defines ecoregions as being large units of land or water that share similar biogeographical characteristics, such as endemic species, environmental conditions, and ecological dynamics, and ecoregions are intended to represent the original distribution of distinct natural assemblages. The WWF has identified 867 terrestrial ecoregions, and 450 aquatic ecoregions. It is important to note that ecoregion boundaries are not fixed, and ecotones, or transition areas, occur between distinct ecoregions. Taking into account the interlinkages between different ecosystems, the ecoregion system of classification is intended to allow for an integrated analysis of environmental changes. Our goal at the Global Forest Atlas is to present information pertaining to forests in a way that acknowledges the importance of the relationships between environmental factors such as hydrology and vegetation, while also incorporating anthropogenic impacts from land use changes and other human activities. The first level of analysis groups forest ecoregions by biome, i.e. boreal, temperate, or tropical forest, to illustrate the shared characteristics of the ecoregions within each biome. Regarding forest governance, land use, logging and other human factors that interact with or affect forest ecosystems, we divide the ecoregion types by country, as each country will have its own political and socioeconomic customs that pertain to forests. 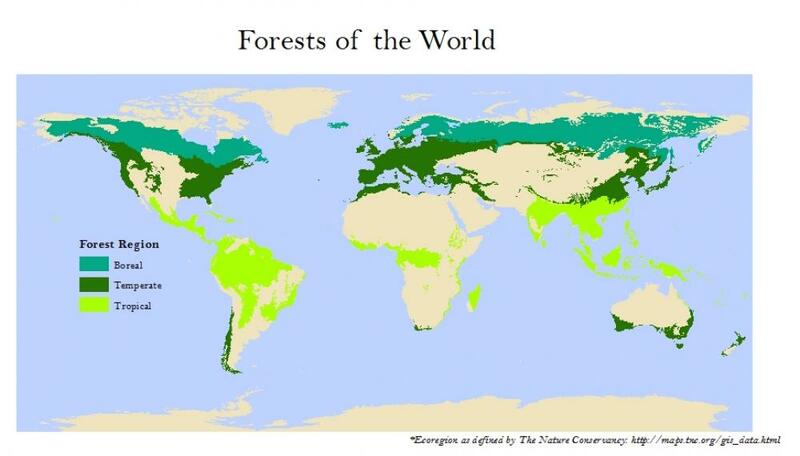 Our plan is to expand our coverage of these main forest types in the future.